Many people think of their bathroom only as a space to take a bath and relieve themselves in. What they don’t realize is that the bathroom is also a sanctuary where you can process the events of the day and wash off all your worries. But it’s difficult to do that in a dirty and gloomy environment. Sure, a fragrant bubble bath can help, but you also need an environment where peace and positive thoughts can thrive to make you relax. After all, a cluttered space and gloomy atmosphere only invite more chaotic thoughts. You need a pleasant-looking and orderly bathroom to unwind at the end of the day and to be invigorated to face the daily grind. From plants to paintings, here are several pieces you need to create a relaxing and elegant bathroom. Add a beautiful painting, a dramatic sketch, or a unique photograph to spice up your bathroom wall. An artwork can liven up any room and add character to any room. It also gives guests something to look at when they use your bathroom. Not many people will put an artwork in their bathroom, which makes it a unique decoration to have in the room. Just remember to protect your artwork from humidity. If you have a talent for art, why not display your own work? You can frame a painting or a sketch and hang it on your bathroom wall. In ancient East Asia, people showed off their skill in calligraphy by displaying original writings on the wall. You can write your own on translucent vellum paper, and frame it to create an elegant vintage-themed decoration. A mirror is one of the most important furniture pieces in your bathroom. You need it to shave your face, apply your makeup, and do your whole grooming routine. Having a mirror in the bathroom can also make the space look brighter and bigger. Like a signature piece, a mirror is a central part of your bathroom decoration. Instead of a plain square mirror, why not use an ornate mirror to add sophistication to your bathroom? One huge ornate mirror can transform your bathroom and make it look completely brand-new. Wicker baskets are not only pretty, but they’re also functional. They make for neat organizers for toilet papers, towels, and bathroom essentials. You can place the basket inside the bathroom cabinet or under the sink. You can also place a basket by the door or the sink to collect your dirty laundry when you take a bath.To save space, you can attach them to the wall as shelves and organize your bathroom things. Freshen up your bathroom by adding plants inside. Growing plants have several benefits aside from the aesthetic appeal. Houseplants can improve air quality, provide fresh oxygen, absorb carbon dioxide, and get rid of harmful air toxins in twenty-four hours. It’s also been proven that having greenery indoors can boost your mood and help you feel more relaxed and calm. You’re not only enhancing your interior by growing houseplants but also improving your physical and psychological health. When choosing plants for your bathroom, you need the kind that can grow in low lighting conditions, high humidity and temperature, and small spaces. Aloe vera, bamboo, begonia, and orchid are some of the plants that thrive in these conditions. Nothing adds beauty to place like flowers can, but natural flowers have such short shelf life that it soon becomes a hassle to change them constantly. With the harsh condition in the bathroom, they can even wither away faster. Fortunately, they can be replaced by realistic-looking silk flowers that are as beautiful as the real thing. Silk flowers are hypoallergenic and long lasting; they’re never out of season too. You can buy a prearranged bouquet or get individual stems to make one yourself and swap arrangements according to your mood. As long as you keep them clean and in good condition, you can reuse them over and over. Imagine yourself reclining on the bath, sipping wine, as the chandelier twinkles overhead. Nothing says fancy like a chandelier in the bathroom does. The gleaming brass and glittering glass crystals can uplift even the most lackluster bathroom. A chandelier is the ultimate accessory to add luxe and elegance to your bathroom. Like wicker baskets, rustic ladders are also functional decorations. That’s right; they’re not just to make your bathroom seem more hipster. 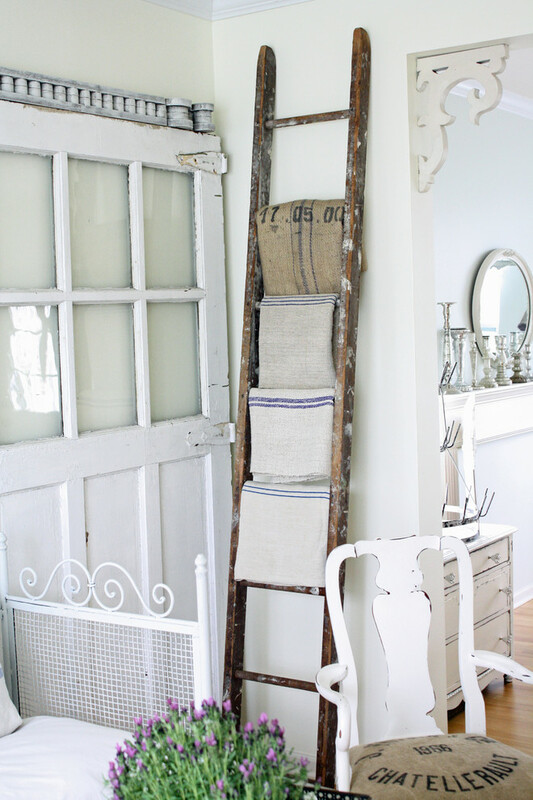 You can use a rustic ladder to hang your towel and clothes. Need a shelf in your bathroom? Use a stepladder to hold your bathroom essentials. You can also arrange your wicker baskets on the steps to complete the rustic aesthetic. If you want a royal feel to your bathroom, replace your shower curtain with a fancy folding screen. In ancient times, folding screens were more than just practical furniture to prevent drafts in homes. Folding screens were often decorated with beautiful art, depicting palace life, mythology, nature, and romance. In Chinese literature, folding screens were often used to show romance and mystery, like the silhouette of two lovers locked in a passionate embrace behind a screen or a domestic scene of newlyweds getting ready for the day. Folding screens were also used by ancient artists to showcase their art and calligraphy. Several lavishly decorated panels of lacquered wood are infinitely more elegant than a plastic shower curtain is. It may seem insignificant, but your bathroom fixtures are important in achieving your desired interior aesthetic. If you’re still using old and yellowed toilets, give them a thorough cleaning, or consider replacing them with new water-efficient models. Although the initial expense may be high, the long-term savings can more than make up for it. While you’re at, you may want to check your fixtures, pipes, pumps, and water heater to see if they’re still working perfectly. If there are leaks, you should fix them as soon as possible to water wastage. Your heating, ventilation, and air-conditioning system (HVAC) produces condensate that may be damaging to appliances, fixtures, and the environment. You can switch to a modern condensate pump to protect them from harmful elements. Don’t be afraid to think outside the box to create the bathroom of your dreams. Remember that your bathroom is more than just a place for hygiene; it’s also a room for peace and relaxation. You can do all you want to do and add your personal touch to make your bathroom as elegant as you want it to be and develop an ambience that’s fit for getting clean and comfortable.